High pressure heating system for shielding gases (argon, Carbon dioxide, helium or Blends). Two inlets (one for each cylinder’s rack) from the top and outlet on the bottom side. 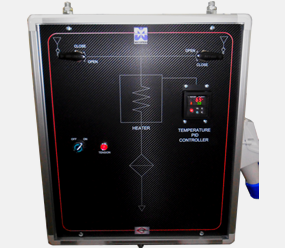 This Heating board is used in order to avoid any risk of freezing of the devices in case of expansion of gases. PID to set the temperature of the gas.